All of my mixdowns start with a list of all the tracks involved, then each one is introduced and blended into the mix depending on its order of importance within the mix. 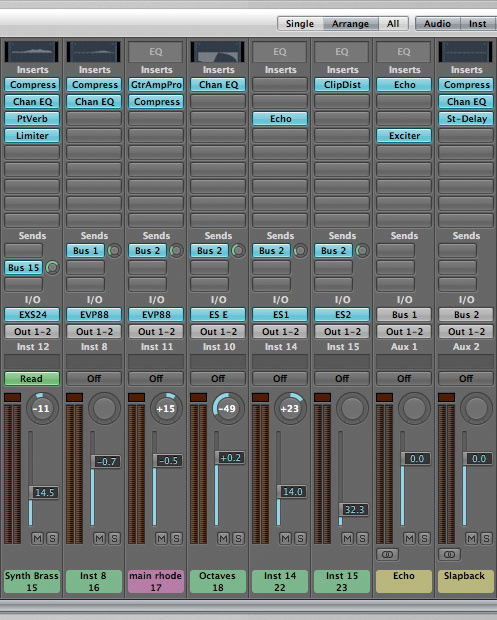 I would usually build and build until all parts have been blended correctly in terms of volume and EQ. When everything is sitting correctly in the mix, and each part is clearly audible, I would then go back through the mix, and begin to add effects. There are few hard and fast rules for using effects in a mix. This Logic mix (above) has lit sends showing multiple tracks routed to the same bus. The bus channel provides the effects for all the individual tracks sent to it. This is often expressed as using 'common' or 'global' effects, and it can produce a more cohesive-sounding mix.The thing is, though, that adding delay and reverb will surely have some effect on the lovely clear mix I have just achieved, so is it generally accepted that it would be more beneficial to add effects to each new part when it's brought into the mix, and only then EQ things to sit comfortably? Surely this way I will end up with a clearer mix? However, by following this approach I figure I'd have to use more effects units, as each track would have its designated effect EQ'd. SOS contributor Mike Senior replies: There are no hard and fast rules here, and every engineer answers these questions differently. Also, specific projects will favour one technique over another. Many professionals who work a lot with live acoustic music and rock bands take the approach of getting as far as possible without effects, so that they don't need to use as much artificial processing to bring about the final result, and thereby often achieve a more natural-sounding end product. Given the quality of many older reverb and delay devices, it's easy to see why this approach has a long and honourable history, and it still remains well suited to straightforward acoustic or rock tracks, which need refining rather than reinventing at the mix stage. For example, I used roughly this strategy for my remixes of Jesper Buhl's jazz trio and Two Spot Gobi's live recording (SOS April & June 2008 respectively), both of which were simply about enhancing what had gone on in the recording room. On other occasions, though, the effects are as important as the instruments, and in these cases you simply have to get them involved at an earlier stage if you're going to be able to judge the level balance and any processing settings in a representative context. When I remixed Imprint's 'Let Me Go' (back in SOS January 2008), for instance, I knew that EQ and balance judgements would be very difficult without the dramatic reverbs and delays in place, so I introduced those at a much earlier stage. 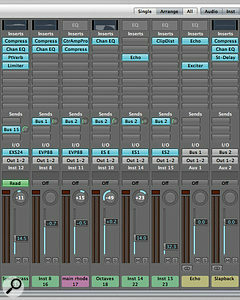 In this mix window shown above, separate effects (shown as inserts) are used for each individual track. Using effects in this way can give you greater control over the way in which each track interacts with its effects.However, the most important thing to say is that neither approach is foolproof, and neither is going to make mixing the linear process you seem to hope it will be. Mixing is highly iterative in my experience, in that no individual level, pan, processor or effects setting can actually be set in stone until the mix is completely finished. Once all the tracks are in the mix, there is inevitably an extended period where you find yourself dotting around between different channels and plug-in windows to respond to a multitude of interactions that are too complex to predict. You might brighten your vocal once the electric guitars are in the mix, but then find that the singer's sibilance hits the vocal reverb too hard. De-essing the reverb channel deals with this problem, but then changes the reverb sound for the piano and tambourine tracks, which also happen to be feeding that reverb. So you maybe change your EQ settings on those tracks, and the process just goes round and round while the overall mix sound slowly shifts into focus. Whether to use 'shared global send effects' or 'separate effects for each instrument' is a question of mixing style, even amongst the professionals. The advantage of common delay and reverb effects is that they help bind overdubbed recordings into a cohesive-sounding whole, creating a kind of imaginary space within which all the separate tracks exist. High-profile producers such as Chuck Ainlay, Mike Clink, John Leckie and Elliot Scheiner have all talked about this very approach in interview, for example. On the other hand, as you say, using separate effects for individual tracks gives you greater control over the way in which each track interacts with its effect, and there are other equally famous engineers who have described using this kind of setup to their advantage as well — Eddie Kramer, Jon Gass and Tony Visconti, to name just a few. In short, there's no simple response to this question either. What's now great is that modern sequencers and plug-ins give you ample opportunity to experiment with both ways of working, because the number of effects units available at once is much less limited in the software world than it used to be in the hardware environment.